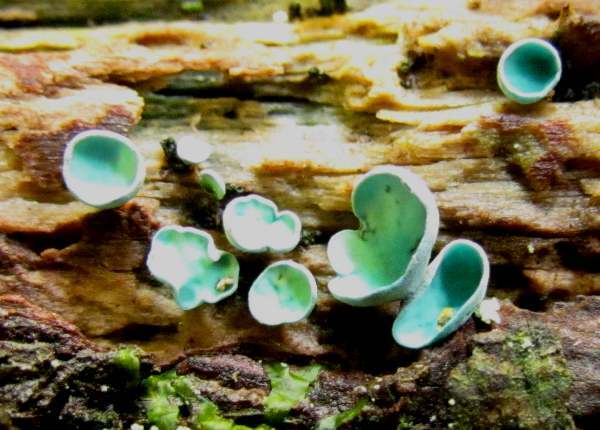 Green stains in timber are evidence of infection by Chlorociboria aeruginosa and the macroscopically almost identical Chlorociboria aeruginascens. The fruitbodies are seen infrequently. 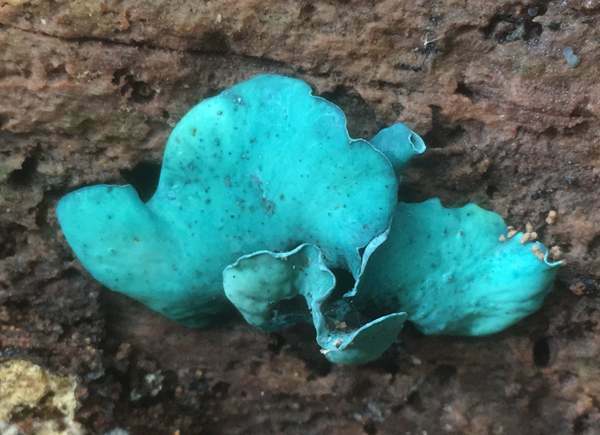 In the past often these winter fungi were referred to collectively as Green Cup Fungus, but in the British Mycological Society's 2014 edition of the List of Recommended English Names for Fungi, the common name Green Elfcup is allocated to Chlorociboria aeruginosa and Turquoise Elfcup to Chlorociboria aeruginascens. Wood infected with Chlorociboria fungi species has long been used in such decorative woodworking as Tunbridge ware. In Italy the practice dates from at least as far back as the 14th century, when it was used in 'intarsia', an inlaying process rather similar to marquetry. 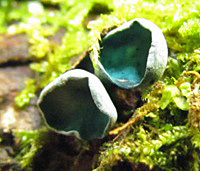 In Britain and Ireland Chlorciboria aeruginosa is one of just two species recorded in the genus Chlorociboria, the other being Chlorociboria aeruginascens. 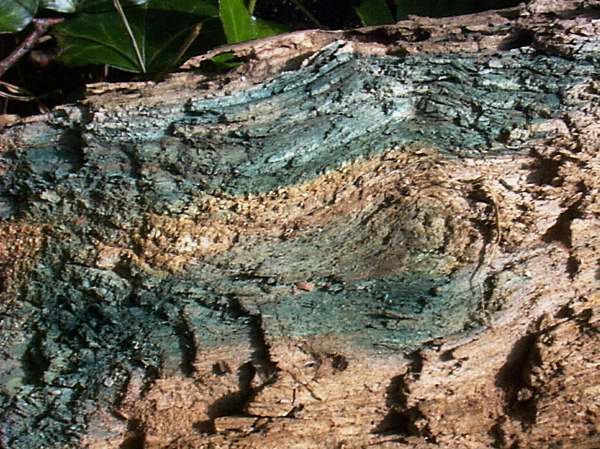 Both result in green staining of timber, as illustrated by the well-rotted piece of oak shown above. 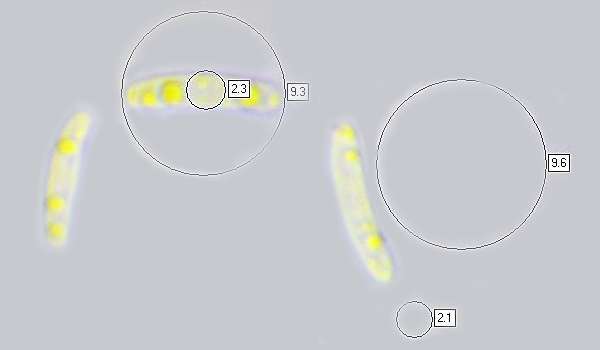 Although C. aeruginosa tends to be a little smaller and very much rarer than C. aeruginascens, the fruitbodies of the two species cannot be confidently differentiated on macroscopic characteristics, but at 5-7 x 1-2µm the spores of Chlorciboria aeruginascens are significantly smaller than those of Chlorciboria aeruginosa (9-14 x 2-4µm). Both species are more often seen in the form of green-stained wood than when when they are producing fruitbodies, but past records made without microscopic study of specimens may have confused the two species. This ascomycetous fungus has a very wide geographical distribution that includes Europe and North America. Described in 1822 and given the scientific name Peziza aeruginosa, thus establishing its basionym, this species was transferred to the genus Chlorociboria in 1957 by American mycologists C S Ramamurthi, R P Korf, and L R Batra. Synonyms of Chlorociboria aeruginosa include Peziza aeruginosa Vahl, Chlorosplenium aeruginosum (Oeder) De Not., and Chlorosplenium discoideum Massee. Chlorociboria aeruginosa is the type species of the Chlorociboria genus. 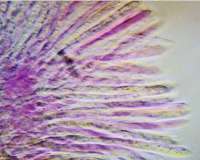 The specific epithet aeruginosa comes from the Latin for copper oxidation or verdigris - a blue-green staining seen on the surface of copper that has become 'rusty' (oxidised). Initially shaped like a goblet with a very short stem that is usually off centre, the fruitbodies flatten with age and develop wavy edges. Individual fruit bodies are 0.5 to 1cm in diameter and usually less than 1cm tall. The upper, fertile surface is bright green and smooth, while the underside of the cup and the stipe are felty and pale blue-green, darkening with age. 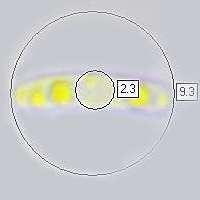 Eight-spored; typically 65 x 5µm. 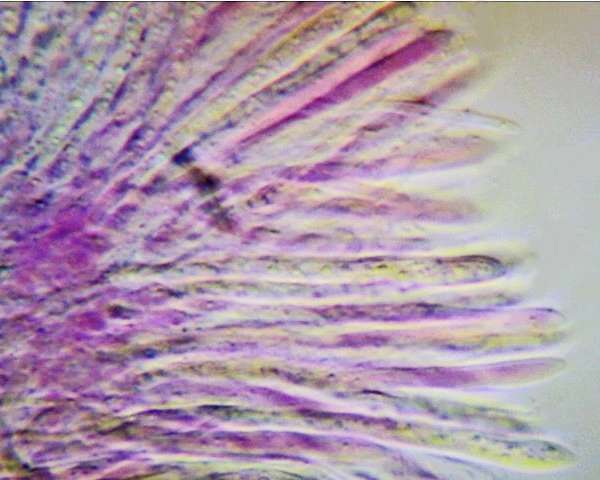 Fusiform, smooth, 9-14 x 2-4µm, with oil droplets visible at either end. Saprobic, on bark-free dead wood, particularly oak, beech and hazel. The green stain is visible all the year round, but fruit bodies occur infrequently and mainly in autumn. Chlorociboria aeruginascens is very similar and can only be separated with confidence by microscopic examination of spore dimensions. Several darker cup-like ascomycetes fungi, including Bulgaria inquinans, occur in similar habitats. Ramamurthi, C.S., Korf, R.P. & Batra, L.R. (1957). A revision of the North American species of Chlorociboria (Scerotiniaceae). Mycologia 49: 854-863. Seaver, F.J. (1936). Photographs and Descriptions of Cup-Fungi: XXIV. Chlorociboria. Mycologia 28(4): 390-394.